It is estimated that there are over 1 million practicing Wiccans around the world today. But what is it that has made these people turn their back on the formal, structured religions that encompass the majority of the Western world? In our modern, high-pressured world, many of us fail to take notice the sheer beauty of the natural world surrounding us. In many ways, this is a travesty: the world we live in today seems so completely distant from the one our ancestors lived in, a world where humans and nature were at one, their existence intertwined in the natural cycles of life. Wicca is a new way of life, a religion that takes you back to a more simple time, before the invention of the high-tech gadgetry we see all around us. You will learn to live and appreciate the natural world that surrounds you, celebrating the intricate changes in the seasons and everything they bring — from the bounties of the Summer harvest, to the cold and darkness of the Winter months, as Mother Nature rests in preparation for the next explosive cycle of life that Spring brings. Wicca is a re-incarnation of the very earliest religions, long pre-dating Christianity. Wiccans celebrate and share many of the same beliefs that these early people held, and try to embrace their way of life, all while remaining fully-functional in today’s modern world. If you’re sold on this new, exciting, peaceful way of life, that’s great! Good to have you on-board. Unfortunately, and despite this commitment, this is where many people get stumped. The truth is, there is no right answer. If you endeavour to learn as much as possible about this religion, follow the core principles (for example, the Threefold Law), and revere the natural world surrounding you, as far as I’m concerned, you’re a Wiccan. If you’re just starting out, I’m sure this vague answer is of little help to you! That’s why I set out to write this mini-series of books, titled Practicing the Craft. In this particular book, you’ll learn everything you need to know about Wicca Book of Shadows – what they are, their history, and what to include in your own Book of Shadows. Practicing magic isn’t compulsory for Wiccans, however many people are inevitably attracted to the religion by the potential to positively change their lives for the better. As such, spellwork is one of the most discussed parts of being Wiccan. 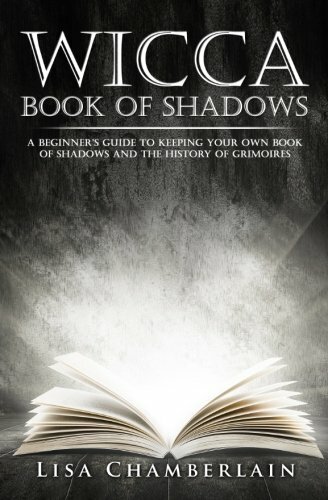 For those wanting to start practicing magic, keeping a Book of Shadows is a good starting point. A Book of Shadows is the ideal place to document your Wiccan journey, write down detailed spell outlines, and write any other information that may help you going forward. Because it contains all of your spells, many Wiccans will take their Book of Shadows into the circle during spellwork, too. Having a beautiful, leather-bound book will make the spell crafting process far more authentic – though you can use any book you like for constructing your own book. Due to the contents, many Wiccans are very private about their Book of Shadows. As such, you will probably want to take proactive steps towards protecting your book. This guide includes several privacy tips, as well as a dedicated spell for protecting your book. In other words, Wicca Book of Shadows will teach you everything you need to know to construct your own Book of Shadows, today! Download now by scrolling to the top of the page and selecting the buy button. Readers will also be treated to an exclusive free gift!